Tip: Try Microsoft Forms to create a survey, quiz, or poll. In PowerPoint, you can create a new form or quiz in Microsoft Forms or select an existing one and insert it into your presentation. Creating or inserting a form is only available to Office 365 Education and Office 365 Commercial subscribers with version 1807 (Build 16.0.10711.20012) or later of PowerPoint for Office 365 on a PC. Find your Office version. People responding to a form or quiz may use PowerPoint on a PC, macOS, or the web. This feature is not available on the semi-annual update channel, but will be soon. Please check back. Learn more about update channels and the Office Insider program. Sign in to Office 365 with your school or work credentials. Open your PowerPoint presentation and choose the slide in which you want to insert a form or quiz. On the Insert tab, select Forms. 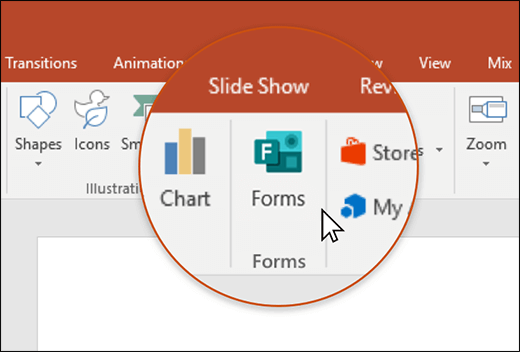 A Forms panel will open and dock on the right side of your PowerPoint presentation. Under My forms, click +New Form or +New Quiz to begin creating a form or quiz. A new window will open with a blank form and default title ("Untitled form"). Learn more about how to create a form or create a quiz. 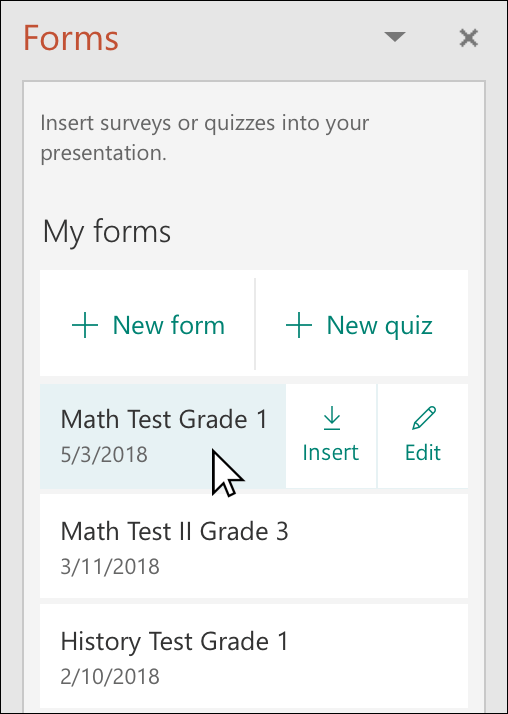 When you're done creating your form or quiz, it will be embedded in your PowerPoint slide and appear at the top of your My forms list under the +New Form and +New Quiz buttons. Find the form or quiz you want to insert into your slide under My forms in the panel. Hover over the title of the form or quiz and click Insert. You can also select Edit if you have more changes to make or want to review results of the form or quiz. 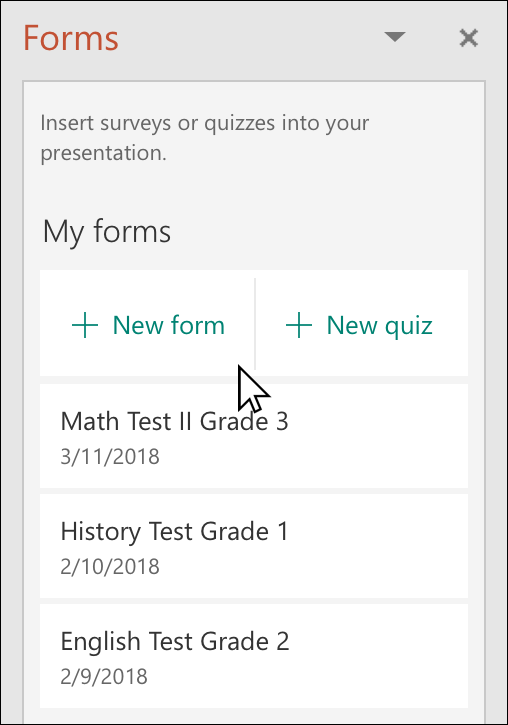 Your form or quiz is now embedded in your PowerPoint slide. Note: If you see the following error message, Office 365 has been configured to prevent individual acquisition and execution of Office Store Add-ins, once you insert a form into your slide, reach out to your admin to enable it. Admins can go to the Microsoft 365 admin center, and then click Settings > Services & add-ins > User owned Apps and Services. For the option, Let people in your organization go to the Office store, your admin can set the toggle to On. Please be aware that it may take a few hours for the change to take effect. Learn more. Share your PowerPoint slides with others via email, OneNote, Teams, and other Office applications. Receivers of your slides can then fill out the form and submit responses without leaving PowerPoint. Learn more about how to share your PowerPoint presentation with others. You can also share a single PowerPoint slide with someone else. To see the responses to your form or quiz, sign in to your Office 365 account at https://forms.office.com/. Open the appropriate form from your My forms page, and then select the Responses tab at the top of the page. Learn more. Got feedback on Microsoft Forms? We'd love to hear from you! Please visit the Microsoft Forms UserVoice site to provide suggestions and vote on ideas others have already submitted.